My review of the previous season finale: The Sea Glass. Vera Stanhope and her sergeant, Aiden Healy, are called in when body is discovered on the shore of an island. Gemma Wyatt was a ranger who lived alone on the island part of the year. She worked with Sophia Ashbrook and her intern Peter Haden. Wyatt was widely liked, but sure enough, as Vera starts to dig, a different picture of the victim emerges. Her solemn, surly sister Alice says, "She knew how to be cruel." Of course, it's possible that Alice is just bitter. Gemma and her boyfriend, Ryan, had been pressuring Alice to sell the family farm, but she refused to budge. The plot thickens when it turns out Gemma was witness to another death, years ago. Danny Anderson worked on the island. An accident with his equipment caused him to fall to his death from the island's atmospheric cliffs. His mother, Caroline, has made her peace with it, but his father Gareth is convinced someone else was responsible for his son's death. Meanwhile, fisherman Michael Hogarth supposedly had an argument with Gemma right before she died, according to his daughter, Vicki. In addition, Gemma had an affair with (island worker? just-hanging-out dude?) Jamil, cheating on her fiance, Ryan Campbell. Still, the timeline has issues. If the killer arrived among the island's afternoon visitors, he or she would still have to find a way off the island unseen by the jetty camera. If the killer left with the crowd, they wouldn't have had time to set up a fake sighting of the victim as well as dumping her body away from where she was found. This sets up a fun puzzle for the episode to solve, though it does solve it a bit too slowly (I totally noticed it before Vera). 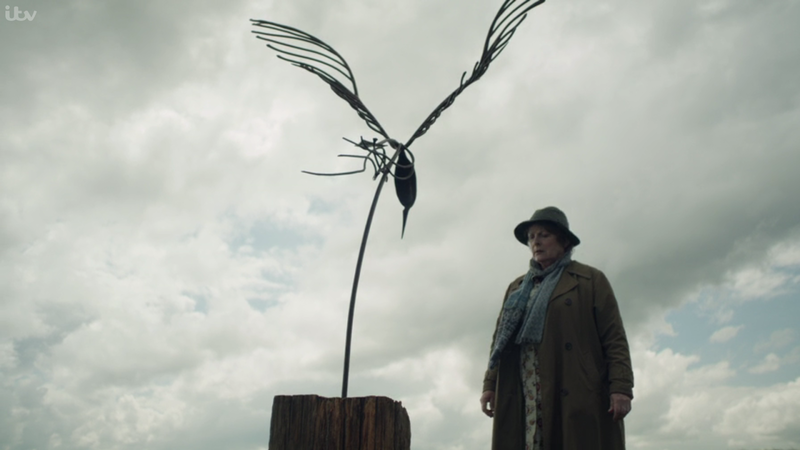 All in all, Natural Selection is a solid reintroduction to Vera's world. The plot is twisty, though it does end on a rather pedestrian note. 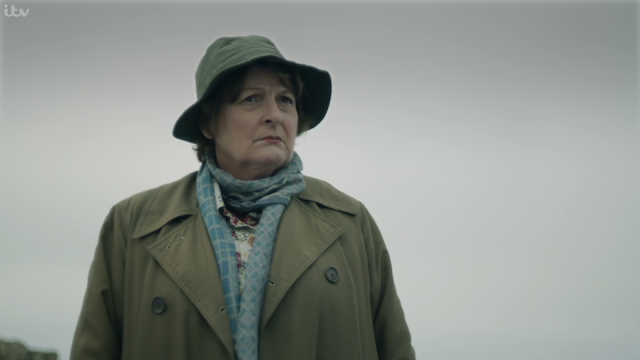 Brenda Blethyn gets to do all the Vera Stanhope character staples: she's motherly and chatty, breaks down a suspect, is mentorly to Aiden, and gives us another Vera's Dad anecdote. She's the heart of the show, and makes me wish the supporting cast had the chops to match her. Am I missing the good old days of Joe and Billy? Yes, I am. Aiden's baby steps of character development (cooking for the missus, former Catholic) pale beside the larger than life, fully rounded Vera. My review of the next episode: Dark Angel. "Gee ma'am, when you said I'd be your bag man, I thought it would entail more than buying you a bag of ready-salted now and then. By the way, are you EVER going to let me drive the Land Rover? I mean, it's been two years." Thanks Hannah for another great review; although (for probably the first time ever) I disagree with you about the programme. 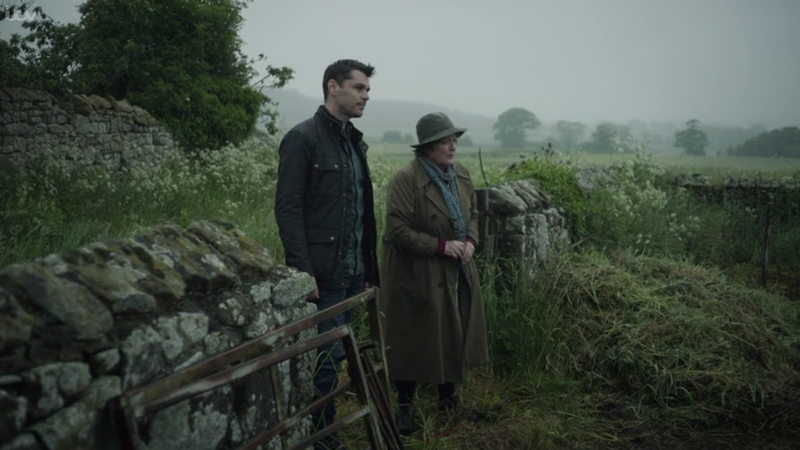 Compared to Endeavour and his relationship with Thursday; compared to Morse and his relationship with Lewis, indeed, compared to Lewis and his relationship with Hathaway, the partnership between Vera Stanhope and Aiden Healy has got to be the weakest between a DCI and their detective ever on terrestrial television. The poor lad is completely under utilised and, for me, it detracts massively from the show. I've watched the episode twice now and I have to say my reaction both times was 'meh'. It was missing something;'je ne sais quoi'. Perhaps it was missing the bright colours from the first episode of series 6. The episode was as grey and dismal as a mid-December afternoon; I might as well have looked out my window for two hours instead. I struggled to know (or care) whether the action took place on the island or the mainland; and more importantly, I struggled to keep track of (or care about) the myriad minor characters. Everyone had a motive, but in the end, the denouement was completely bathetic. Meh. I really do love Vera and have looked forward to this new series for the past several weeks (since it was announced), but I have to say, this one was a major disappointment - if you ask me. Here's hoping the next installment is better. Well, we agree on Aiden, anyway. He was cast because he looked like Joe, but brought none of the other character's religious complexity and personal maturity. His humility and devotion to making Vera a better person really made their partnership something special. On the other hand, Aiden is a whiny hunk who seldom has anything to add to the investigation, much less Vera's character development. As for the episode itself, I wish I'd had time to revisit some earlier episodes to compare it with, but it rather caught me by surprise, and I had to rush to get a review out. But I did enjoy the plot - I thought the cliffs and the puffins were both fun elements to the location. The ending was cliched and annoying. However, I enjoyed watching Brenda Blethyn do her thing. The American accents were terrible! If Morse hadn't called Roz an American, I wouldn't have known she was supposed to be one. It's always the brittle consonants that clinch it for me. And the scarf was so ugly?! Ps we normally understand series but this was sooooo bad regarding plot and story line OMG.